N'Golo Kante was vital to Leicester City's incredible title run, and he's now at the center of Chelsea's charge to the top of the Premier League table. The last player to win the Premier League title while playing for different clubs in successive seasons was Eric Cantona*. This season, 24 years on and assuming Chelsea defends its 10-point lead, N’Golo Kante will emulate him. Both are French, they share a first syllable to their surnames, both are hard-working and both have galvanized doubting teammates, but it’s hard to imagine two less similar players. *That’s assuming you ignore the claims of Mark Schwarzer who was a backup goalkeeper at Chelsea in 2014-15 and Leicester in 2015-16 and so was part of two title-winning squads–without playing a game in either season. Cantona arrived giving the impression that he was doing English football a favor by playing in it. He had an arrogance and a charm, he was reckless and he sought the limelight; he made those around him believe because he had such an excess of self-belief. Kante, on the contrary, is self-effacing. He has risen from the obscurity of the French lower leagues in a remarkable short period of time. He is humble and diligent, and the inspiration he offers stems from the fact that he plays with the energy of two men. It would probably be an exaggeration or over-simplification to say that the difference between the relegation-haunted Leicester this season and the title-winners of last year is Kante’s departure, but nobody should doubt its significance. In that deep-lying midfield role he protected the center backs Wes Morgan and Robert Huth so thoroughly that their jobs became little more than heading away balls played over him or crossed in from the flanks. Without Kante, both Morgan and Huth have been exposed and have looked exactly what they are: aging players of limited pace who struggle to cope when players get a run at them. Similarly, Danny Drinkwater, who last season was forever measuring balls over the top for Jamie Vardy to run onto, has found himself having to perform additional defensive work and has looked vulnerable without his hyperactive partner. He’s been reduced to 0.5 key passes a game this season, compared to 1.3 in the title-winning campaign. Kante is not the only difference between the Chelsea of last season and the Chelsea of this much more fruitful campaign, but on the field he is the biggest change. Just as he got the best out of Drinkwater, so, too, has he rejuvenated Nemanja Matic, whose key passes are up by a third. And just as he protected Morgan and Huth, Gary Cahill, Cesar Azpilicueta and David Luiz have thrived behind him. 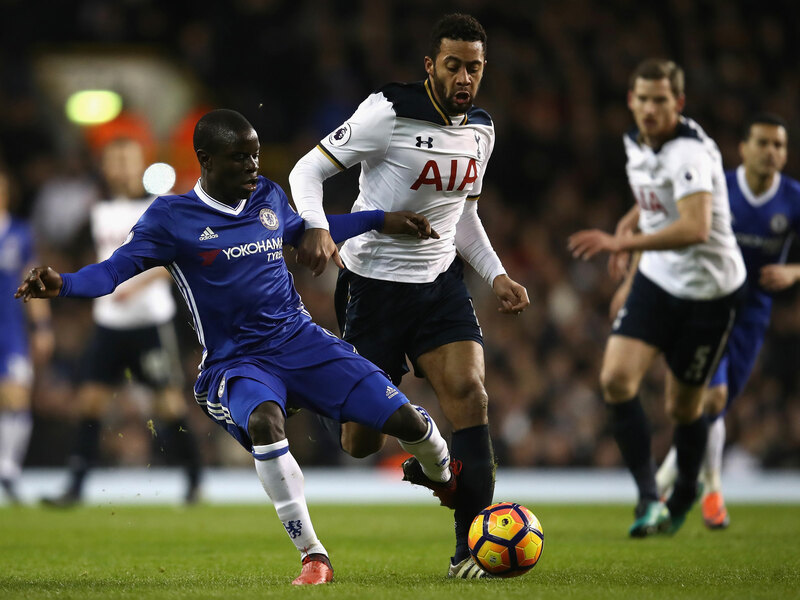 Entering the weekend, Kante had made 3.6 tackles per game this season, the third most of any player in the Premier League. He had also made 2.3 interceptions per game, the fifth-most of any midfielder. But to categorize Kante as purely a destructive player would be misleading. The obvious comparison is with Claude Makelele, another French former Chelsea player who operated to profound effect just in front of the defensive line. It was his reading of the game and his ball-winning that caught the eye, but he was also vital for the way he would initiate attacks, a metronome who could be relied upon not to give the ball away. (Kante himself says his role model was Lassana Diarra, another French former Chelsea player who is only six years older but is currently without a club having been released by Marseille). Kante’s pass success rate is 88.3% this season, the 16th best in the league. That only tells part of the story though. Only two of the players above him in that ranking play more passes per game and only one more plays more long passes. Kante is not, in other words, just nudging a simple ball to a teammate; he is achieving that level of accuracy with a full range of passing. Last Monday, Kante made 50 passes, 45 of them accurate. Yet just four years ago, before his reported £29 million move to Chelsea and before he became a part-time starter for host France at Euro 2016, Kante was playing for Boulogne in the French third tier. He helped Caen to promotion from the French second tier the following season and after just one year at the highest level in France, moved to Leicester. What happened there, of course, bordered on the miraculous, so much so that Chelsea’s elevation from 10th to first seems almost normal. Cantona, of course, stayed at United and after his glorious first season and won three more league titles. Kante is only 25. He could easily match that. But he could surpass Cantona, who never quite turned it on in the Champions League. Kante hasn’t even played a Champions League game yet, and that is the next challenge.